Heavy mineral sand contains lots of heavy minerals, hence the name. The density of these minerals is generally above 2.9 grams/cm³. Important heavy minerals are magnetite, garnet, ilmenite, zircon, spinel, augite, staurolite, hornblende, rutile, kyanite, tourmaline, biotite, titanite, apatite, etc. 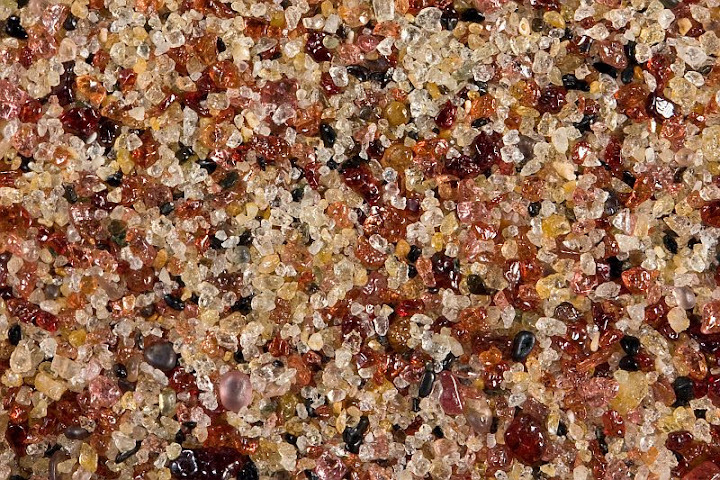 Heavy mineral sand from Sri Lanka which contains lots of intensely colored spinel grains. Width of view 20 mm. These minerals often occur in sand, but usually in low quantities (less than 1 percent). Sometimes they get concentrated in beaches or river bottoms to form beautiful and unusual-looking sand samples. The composition of these sand samples is highly variable. The most common constituents of heavy mineral sands are garnet, magnetite, ilmenite, and epidote. Most heavy mineral sand samples contain quartz as well, but it is not as important as usual. Beach sand from Calvert Cliffs State Park, Soloman Islands, Maryland. Black mineral is ilmenite, yellow spots on some ilmenite grains are composed of leucoxene, pink mineral is almandine garnet. The source materials of heavy mineral sand are metamorphic and igneous rocks. 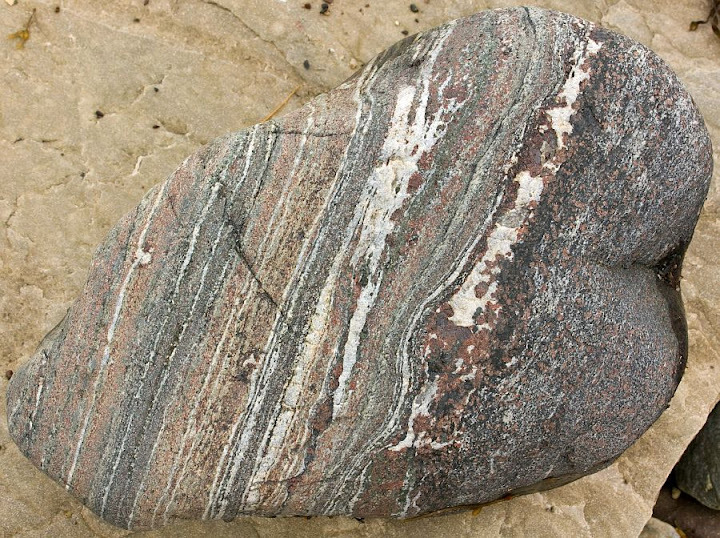 Metamorphic rocks give rise to sand containing kyanite and garnet, for example, although the latter may crystallise from magma as well. Magnetite is mostly of igneous origin. Heavy mineral sand is a natural mineral concentrate which is often mined commercially. 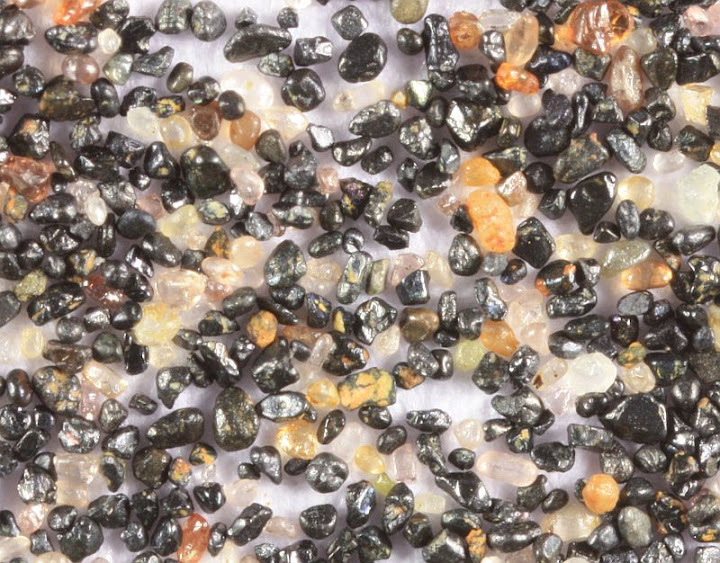 Zircon, gold, ilmenite, rutile, monazite, and cassiterite are some noteworthy heavy minerals that are often extracted from sand. Heavy mineral sand is not rare, but its area of occurrence is usually limited. 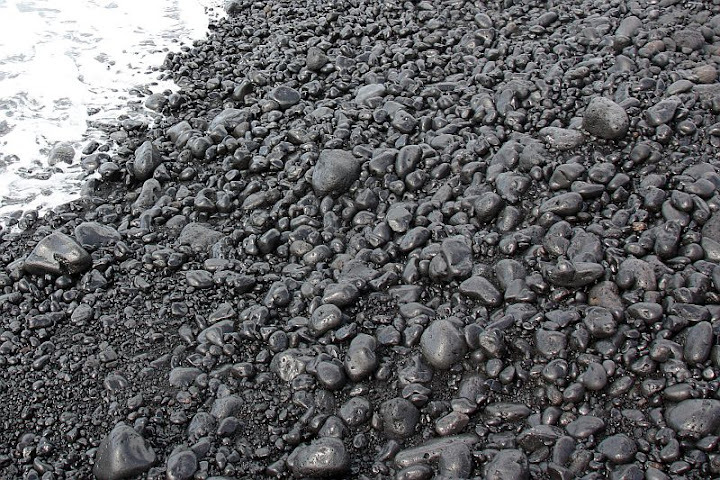 Heavy mineral sand forming as basaltic pebbles are pounded by waves on the coast of La Palma, The Canary Islands. 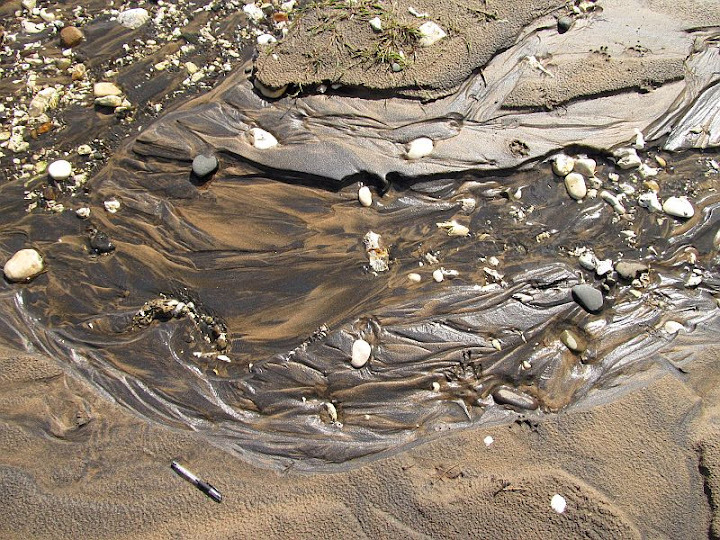 Black stripes in sand are usually composed of tiny magnetite grains. White Park Bay, Northern Ireland. Magnetite grains from a heavy mineral sand from Guam (Talofofo Beach). These magnetite grains are aligned in the presence of a strong external magnetic field. Width of view 10 mm. Metamorphic boulder on the coast in northern Norway (Varanger peninsula). It is composed of magnetite, garnet and quartz. These are very common constituents of heavy mineral sands and the rock may be a metamorphosed placer deposit. Width of sample 36 cm.